Patti's present to herself and the rest of us as she marks the occasion of completing her (if you can believe it!) sixtieth year, Twelve is a record of (yes) twelve covers of some of her favorite songs. Many are expected -- "Are You Experienced," "Helpless," "Gimme Shelter," "White Rabbit," "Soul Kitchen," "Smells Like Teen Spirit" (what? you didn't know she was a big Nirvana fan?) -- some make sense once you stop and think about them -- "Within You and Without You," Dylan's "Changing of the Guard," which receives a heart-tuggingly beautiful rendition here and has to be one of the best Dylan covers in twenty years or more, The Allman Brothers' "Midnight Rider" -- and then there are the total surprises -- Tears For Fears' (?!) "Everybody Wants to Rule the World," Paul Simon's "Boy in the Bubble," and Stevie Wonder's "Pastime Paradise," which closes the record on an uplifting and hopeful note. 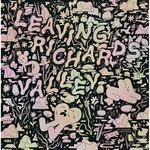 The core of the Patti Smith Group -- Jay Dee Daugherty, Lenny Kaye and Tony Shanahan -- show their love of this music by forging one well-crafted tune after another. A bevy of guest appearances including Flea of the Red Hot Chili Peppers, Smith's children, Jackson and Jesse, and, especially, Tom Verlaine -- on "Gimme Shelter" and "White Rabbit" -- serve to spice up the mix. The stand out track has to be "Smells Like Teen Spirit," which is much more than a cover version. 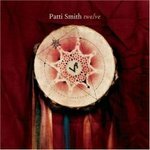 What we have here is Patti's own take on the meaning of the song, the significance of Nirvana and, finally, her sense of the continuity that exists in American vernacular music. You'll never hear the song the same way again. This disc is the treasure at the end of the rainbow. 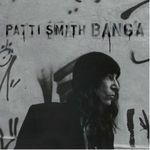 Patti & Co.'s first album of originals since 2004's Trampin', is a mix elegiac tributes, informative history and ecstatic invocations, spoken, chanted and sung to melodious rock 'n' roll. Any and every Patti Smith listener, devotee and aficionado will find what they are looking for here, and true believers will passionately embrace it. And, as always, we hope that this will be the first Patti Smith record for some, and that casual listeners will take this opportunity to step a little closer to music and pay that critical bit of extra attention that will allow them to reap disproportionately large rewards. Banga is a finely woven tapestry of rock history beautifully played. Surprising hints of The Beatles and Bowie and more (even a throw away Zeppelin quote) intertwine with Tom Verlaine licks and classic Patti Smith Group riffs and stylings, making for a great listening experience that just keeps getting better each time through. And it is, of course, what Patti is saying in the songs that takes everything to the next level. For our money, the next to last track, Constantine's Dream is as heavy as it gets and is well worth the price of admission all on its own. You won't find a song like this anywhere else. Patti Smith is the high priestess of Rock – as if there were ever any doubt. Then, exit to the dark lullaby of Neil Young's "After the Gold Rush".